My craft space is a very important part of me. 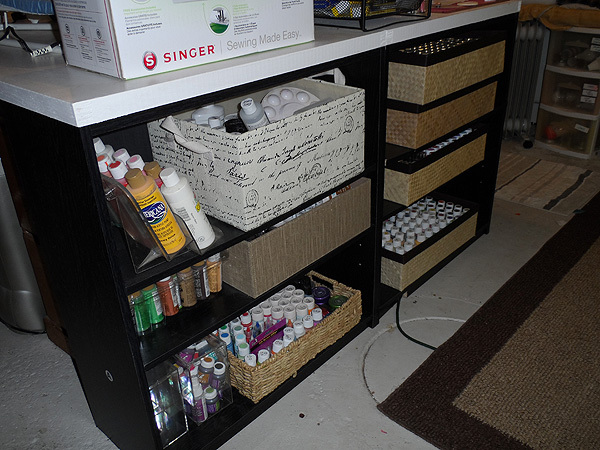 I spend a lot of time in my craft room, and I have tons of supplies, so it has to be organized in a way that works for me. I actually thought I had shared my craft space with you here before, but after looking through apparently I haven’t! It’s been about 6 or 7 months since hubby and I built my table. I was able to bring many of my supplies closer and get a grip on things I use regularly. Each side of my table has a purpose. One side houses items that I use fairly regularly such as felt, different types of glue, flat marbles, recycled items, fabric, pom poms and paper plates. The other side holds all manners of paint. Acrylic craft paint, enamels, fabric paint, gloss, matte, outdoor paint, and all sorts of mediums such as crackle, stains, and of course, Mod Podge. 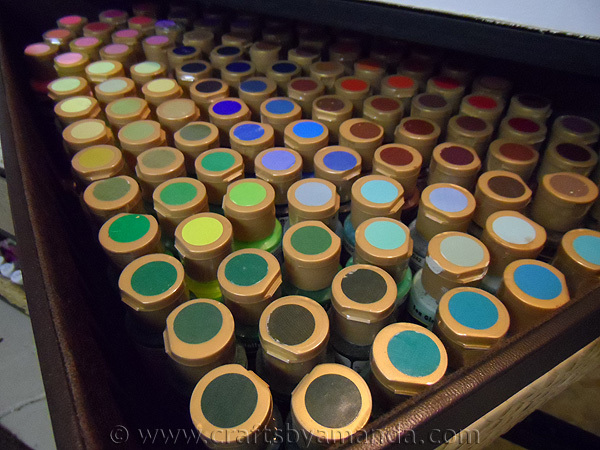 I have well over 400 bottles of paint, so keeping them in check is imperative! Let’s begin with that big collection of paint. I found some rectangular containers on sale at Michael’s. They were the perfect height to fit my paints. I don’t like storing paint upside down, so instead, I mark the top of each bottle with the paint color that it holds. Some paints, such as Americana from DecoArt, come already marked. Any that don’t I simply dot the color on the lid with my finger. I keep all of my acrylics together, sorted by color. 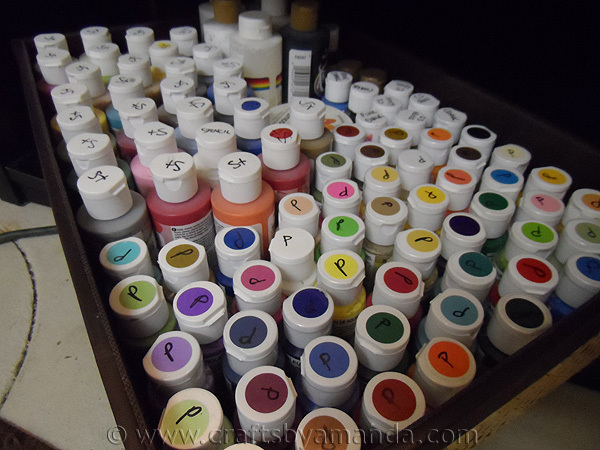 Other containers hold different types of paint such as gloss enamels and pearls. Each one is marked with initials on top (P = Patio Paint, St = Stencil Paint, etc) making it much easier to find what I’m after quickly. 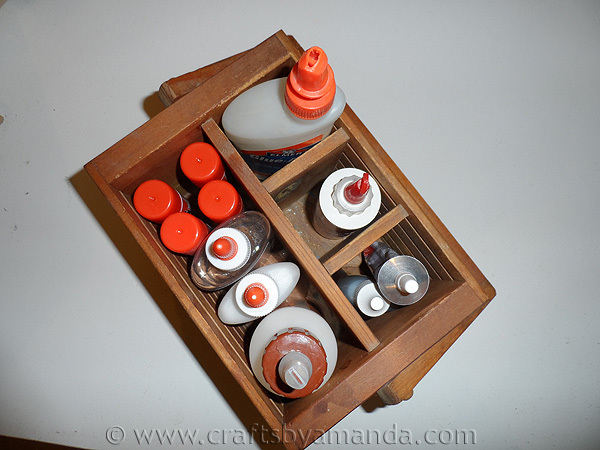 On the other side of the table I keep all of my glues. A simple thrift store wooden basket holds glue sticks, wood glue, Gorilla glue, Tacky glue and E6000, among others. This is also where I keep several of my kid’s craft supplies such as pipe cleaners, paper plates, plastic cups and felt. Oh the felt that I have! For a long time I struggled with organizing all the felt sheets I had on hand, now they are stacked in plastic containers that fit the sheets perfectly. As you can see, I have a large plastic container filled with pipe cleaners too, seems to be the neatest way to keep control of those crazy buggers. Baskets from garage sales are ideal for keeping things contained. I like that they look nice and neat and they are perfect for holding miscellaneous items hidden from view. You will also see plenty of tall plastic containers. Another trash can rescue if you will. My husband brought home an entire case of Beanie Baby holders and asked if I could use them. What a guy! To go along with all that paint, I also have tons of paintbrushes. Jars are usually my go-to brush and pen holders, so you will always find a slew of jars across the top of my work surface. Since everyone has a different method that works for them, I urge you to head over to HouseLogic where you’ll find all sorts of great storage ideas. If you have a small space and need big ideas, check their Small Home section too. Browse around like I did, and you are sure to glean some fabulous inspiration! 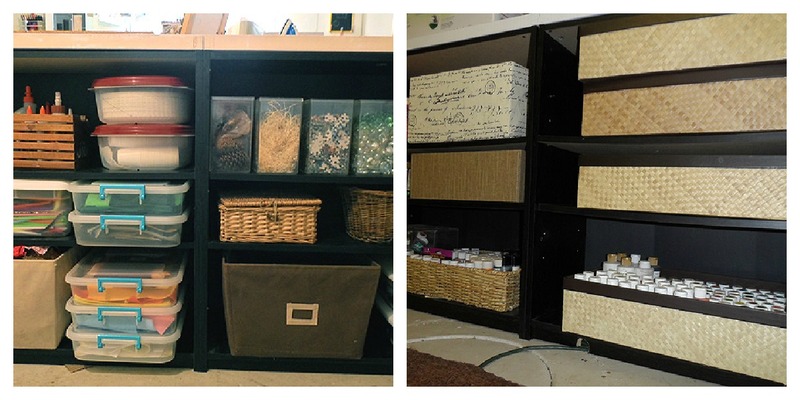 What types of storage solutions do you use in your craft room? Share in the comments, we are dying to know! HouseLogic is a free source of information and tools from the National Association of Realtors® that helps homeowners make smart decisions and take responsible actions to maintain, protect, and enhance the value of their home. HouseLogic helps homeowners plan and organize their home projects and also provides how-tos, news, home improvement advice, and information about taxes, home finances, and insurance. Learn more at www.houselogic.com. Compensation was provided by HouseLogic via Glam Media. The opinions expressed herein are those of the author and are not indicative of the opinions or positions of HouseLogic. Wow ! it looks so amazing ! I really like that you have aloooot of space. Until now, all i can have for my craft corner is a desk and a chair :)). I keep my fabrics in plastic fruit baskets, the ones from local market, materials fits perfect in them. Thanks so much InGeLiTzA! There’s still a lot of work to do, but at least the things I use regularly are easy to get to!